Capable of delivering end to end civil engineering and infrastructure projects, Nace Civil Engineering prides itself on excellence, suiting individual needs and pioneering solutions. As one of Australia’s first concrete paving companies, Nace Civil Engineering has developed a reputation for excellence; by controlling the construction and delivery of projects from start to finish and utilising the specialised resources of the Kypreos Group of Companies. These in-house capabilities ensure Nace Civil Engineering can manage every element of clients infrastructure needs from water, power, sewerage, road and telecommunications infrastructure. From design through to construction and completion, Nace Civil Engineering has the experience and expertise to provide an innovative and cost efficient solution to all civil engineering projects. Combining the vision to meet client needs with the responsiveness to manage client concerns, Nace Civil Engineering approach every project with nimbleness and dedication; ensuring clients achieve high quality construction within budget and on time. 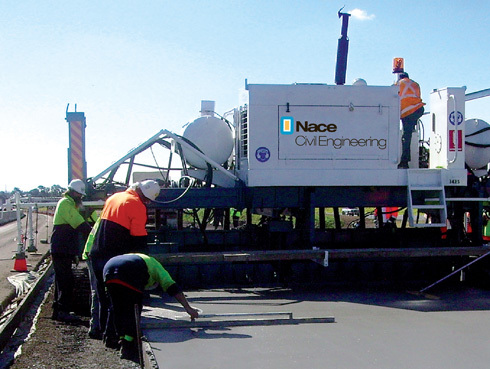 A leader in the civil engineering industry, Nace Civil Engineering was a pioneer in slipform concrete paving; a solution complimented by the businesses capacity to undertake a wide range of earthworks and excavation works; all using in house equipment. Nace Civil Engineering’s quality of work is highly regarded by leading professional organisations and has allowed us to be involved in the construction of all major motor ways in and around Sydney and throughout NSW, including; the M5, Camden Valley Way, Princess Highway, Central Coast Highway and MR92. Nace Civil Engineering has also been involved in a number of specialised projects such as the redevelopment of Hyde Park, the construction of pedestrian and vehicle tunnels at Rose Hill Race Course and the rebuilding of the jetty and sandstone walls and security elements of Admiralty House. Transport including Rail, Roads and Airport. Urban development including roads and services, earthworks, pavements and landscaping. Lakes Development, marine works including jetties, slipways, boat ramps and foreshore protection. Defence facilities, specialising in constructing commercial facilities for asphalt production and glass manufacture, office blocks and shopping centres. Nace was awarded the Princes Road Upgrade from Acacia Road to Kingsway, Kirrawee and additional intersection improvements on the Princes Highway, Acacia Road, Oak Road, Kingsway and President Avenue, Kirrawee. The project involves the making improvements to the intersection of the Princes Highway with Kingsway, Oak Road and Acacia Road, and the intersection of Acacia Road with President Avenue to help improve traffic flow, travel times and safety for all road users, particularly during peak periods, widening of the existing carriageway in each direction with dedicated turning lanes. Nace completed works on Alfords Point Road Upgrade between Brushwood Drive and Alfords Point Bridge over the Georges River in October 2017. The project involved the upgrade of Alfords Point Road, a 2.1 km widening from a four-lane undivided carriageway road to a six-lane divided road with three lanes in each direction separated by a concrete median, to improve traffic flow and road safety. Nace was able to complete this project two months before scheduled completion and with minimal disruption to the daily users of the carriageway. Nace were recently awarded Alfords Point Road Upgrade between Brushwood Drive and Alfords Point Bridge over the Georges River. The project involves the upgrade of Alfords Point Road, a 2.1 km widening from a four-lane undivided carriageway road to a six-lane divided road with three lanes in each direction separated by a concrete median, to improve traffic flow and road safety.